There's no question about it. I like this band. Striker delivers no nonsense classic heavy and speed metal in its truest form. Armed to the Teeth is their sophomore release on Napalm Records. Striker: it comes in pints! I'm getting one! 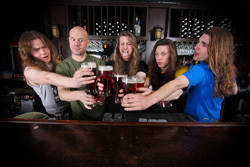 The pioneers and peers of their genre, like Saxon, Iron Maiden, Annihilator, and Exciter, would be proud of this band's energy and sound metal craftsmanship. It's not also speed, but also great vocal arrangements, including some good gang shouts, a vigorous rhythm section, and a massive twin guitar assault. Melody and metal, energy and big guitars, how great is that? Notable speedy cuts include Forever, Wolf Gang, and Let It Burn. For more traditional melodic heavy metal It Would Be Worse, Fight For Your Life, and Land of the Lost are terrific and entertaining. Both of the latter songs also shows the strength of Striker's arrangements, versatile without being overly complex. Frankly, I don't think there's bad song here. Armed to the Teeth is simply a well-crafted true metal album. Strongly recommended. 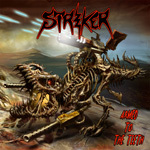 Striker's Armed to the Teeth is simply a well-crafted true, classic heavy and speed, metal album. Strongly recommended.